samuel_howard_ltd has no other items for sale. Crosman 180 One (1) Complete O-Ring Seal Reseal Kit .22 cal. 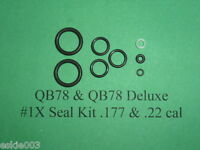 QB78, XS78, TH78 Complete O-Ring & Seal Kit #1X .177 & .22 cal. Crosman 130 Air Pistol One Complete O-Ring Seal Kit for .22 cal. 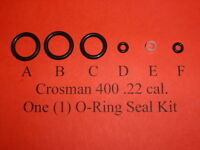 Crosman Model 400 One Complete O-Ring Seal Kit .22 cal. Crosman Model 150 Pistol Two (2) Complete O-Ring Seal Kits .22 cal. 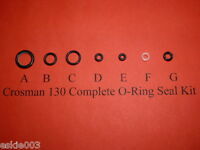 Crosman Model 140 One Complete O-Ring Seal Kit for .22 cal. Crosman Model 130 Air pistol Two (2) Complete O-Ring Seal Kits for .22 cal. 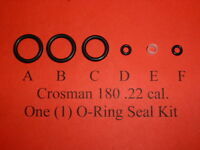 Crosman Model 157 One Complete O-Ring Seal Kit for .177 cal. 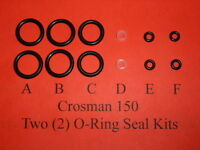 Crosman Model 150 Pistol One Complete O-Ring Seal Kit .22 cal. Crosman 180 Two (2) Complete O-Ring Seal Reseal Kits .22 cal. $2.25 shipping for each additional eligible item you buy from samuel_howard_ltd.